Welcome to one the automotive worlds most exciting weeks. Monetery Car Week. In honor of the prestigious week we will be visiting 5 pre war classics you did’t know you could afford and would be proud to park on the lawns of Pebble Beach. Packard. One of the most desirable automobiles ever created. Just ask the man who owns one. To many Packard was the finest automobile produced in the United States. The marque built automobiles for the business mogul that had not only succeeded as an entrepreneur but was also so rich that they did not need to flaunt their hard earned wealth. Packard built class and everyone knew it. 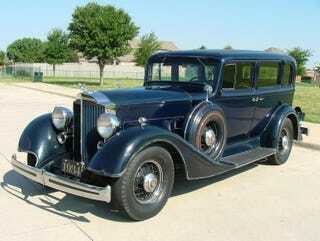 The 1934 Packard 1100 was the marques entry level automobile starting at $2,820. However it was hardly spartan. The 1100 was powered by a 320 cubic inch straight eight that produced 120hp. With an interior fit for the countries finest the Packard does not disappoint. Only the most regal wood was used. The wood was paired with a gauge cluster than could be considered a masterpiece, the 1100’s interior is a reminder you have made it in this life. Priced on Hemmings website at $36,500 anyone looking for a car that is as beautiful as the majestic cars at Pebble Beach need not look further. The 1100 exudes class, beauty, character, and craftsmanship. Buy it now before you decide to buy a 65 Mustang like everyone else at your local car show.